A line of Vietnamese students walks toward a camera. The students in blue shirts are taking turns to recite something -- in Japanese, not Vietnamese as might be expected. What the Vietnamese students are reciting is the Feb. 8 Independence Declaration, a document originally read by some 300 Koreans in Japan in February 1919, a month before the March 1 Independence Movement saw Koreans taking to the streets shouting for independence from Japan’s colonial rule. “2.8 Declaration of Independence / Reading in Japanese” by Hikaru Fujii connects the past and present: The past the suppressed Korean people under the Japanese colonial rule, and the present the Vietnamese in Japan, who suffer discrimination in the country. 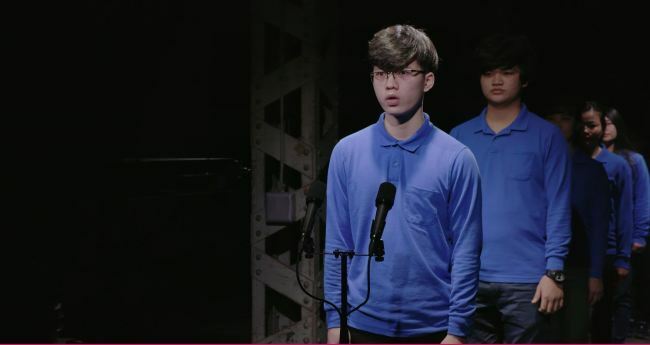 “Playing Japanese,” for which Fujii won the Nissan Art Award in 2017, includes footage from a workshop he organized in which dozens of members of the public were asked to act out historical texts from the 20th century on an imperialist “human exhibit” that took place in Japan in the early 20th century. “If the previous work dealt more with contemporary Japanese people’s take on Japan’s occupation of other countries in the past, the latest work attempts to situate Japanese imperialism in a more international scope,” the artist said during a press conference Thursday at the Seoul Museum of Art’s Namseoul branch. Fujii is one of six artists featured in the latest exhibition at the SeMA located in Namhyun-dong, dedicated to commemorating the 100th anniversary of the March 1 Independence Movement here. The six artists are Ahmet Ogut, Yao Jui-Chung, William Kentridge, Nguyen Trihn Thi, Jane Jin Kaisen and Fujii. Rather than a display of historical documents and artifacts related to the movement, “Zero Gravity World” aims to place the March 1 Independence Movement in relation to other historical events, tragedies, different forms of injustice and, most importantly, the people who stood against injustice their own ways. “The exhibition regards the March 1 Independence Movement as one of the global movements that took place against colonial power and injustice,” the museum said. “More Sweetly Play the Dance” (2015) by Kentridge is a large scale video installation that takes on the issue around life, mortality, migration, and displacement. 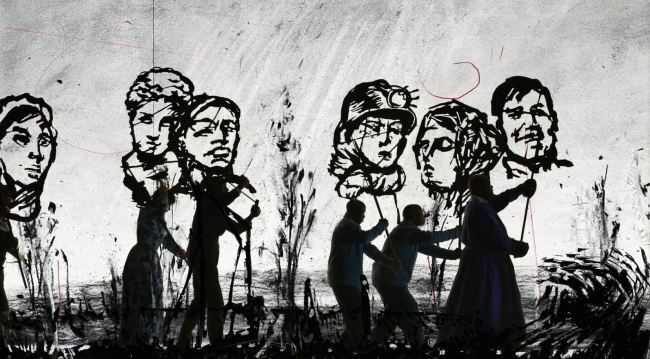 Composed of seven large-sized screens -- originally eight -- deployed in a circle, Kentridge has made black silhouettes of people marching, inspired by marches of refugees from Rwanda and the line of wartime victims of World War II. By inserting multi-layered noise and music to the visual installation, the artist embues the silhouettes marching against violence and repression with optimism. Kaisen’s “Reiterations of Dissent” -- a multi-channel video installation -- remembers the Jeju April 3 Resistance and Massacre of 1948. The Jeju Resistance, during which 25,000 to 30,000 people are estimated to have been killed in a wave of anti-communist suppression, claimed the second largest number of victims in modern Korean history. Yet, the event was systematically silenced for ideological reasons. “Letters from Panduranga” (2015) by Trinh-Thi is a film with essay-like quality. The film, structured as a letter exchanged between a woman and a man, focuses on Ninh Thuan (formerly known as Panduranga), once the spiritual home of the Cham community and now the planned site for Vietnam’s first nuclear power plants. The exhibition also includes “Fantasized Fantastic Corporeal World” by Ogut and Yao’s photograph series “The World is for All China Beyond China” (1997-2000) and “Long Live“ (2011) and “Long Long Live” (2013).